The present El Niño is the strongest ever recorded, scientists have confirmed. The weather system, which is triggered by a warming sea surface in the Pacific Ocean, has smashed its 1997 record in past three months. It follows news by the US National Oceanic and Atmospheric Agency (NOAA) that water in the Central Pacific Ocean reached 3.1°C above its average on November 18. That is significantly higher than the 2.8°C recorded during the 1997-1998 El Niño. Now, a new study by Jan Null, a meteorologist at Golden Gate Weather Services in California, has backed that data. 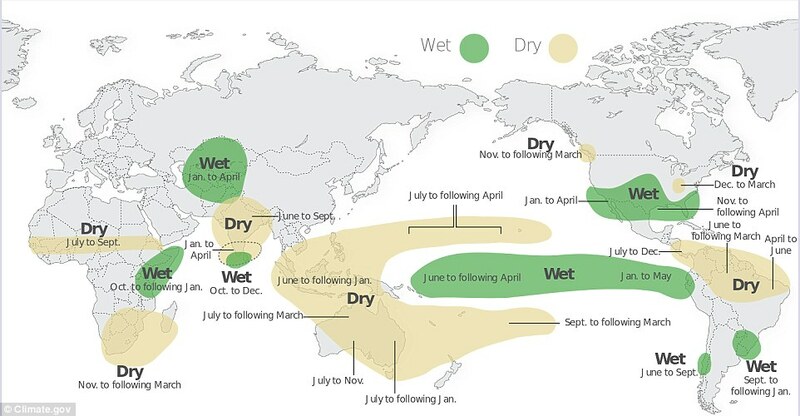 Meteorologists measure El Nino based on how warm parts of the central Pacific for three consecutive months. Records go back to 1950. ‘We have pretty much had it nailed since late summer, early fall that this was going to be a very strong El Niño,’ Null told the New Scientist. His study found that the past three months score ‘a very strong 2.31 on the oceanic Niño index’. This is one of the primary measures of anomalies in sea surface temperatures and compared to 2.26 for the previous strongest El Niño in 1997. Scientists believe the weather phenomenon has reached its peak, and will gradually die out over the next few months. But forecasters have warned that even though they expect the sea surface temperature anomalies in the tropical Pacific to decrease gradually, ‘there is still a lot going on’. For America, they warn the effect is ‘just beginning’. ‘El Niño put up some pretty impressive numbers in December, and we’re favouring a transition to neutral conditions by the late spring or early summer.’ Emily Becker of the NOAA said.